Only way to avoid cv joint replacement is very important to know how your car works. Not to become mechanic to fix it, but to have some knowledge and learn the basics of your car components functioning. While the mechanical basic can save you money when you drive your vehicle to an automotive service centre or to perform few simple routine maintenance. The constant velocity joint is called by the most car owners form the side shaft. Is connected to your gearbox by one inner cv joint and at your wheel by one outer joint. The function of cv joint replacement allows a rotation side shaft to give power and speed to your front wheels, with less metal friction, that permit your car to drive smoothly with perfect engine performance. Some rear wheel drives cars contain the side shaft at the rear axle. The drive shaft can be at the front or at rear it is fitted to each ends of side shaft full with lubricant grease and cover rubber or cv boot. Do You Know How To Prevent Your Car CV Joint From Damage Or Wear. The only perfect way to protect and extend your cv joint replacement life is to full up it with quality lubricated grease, to clean and remove dirty grease. If you keep and driving your vehicle with torn cv boot and dirty grease can cause side shaft to wear and start making noise in turn left or right is your outer cv joint. And some time when you are driving straight is your inner joint. Damage and or wear of your outer and inner joint can cause also high vibration at when your car is on some speeds. The vibration is caused by wear of your drive shaft is same if your vehicle wheels are not balanced. Less of lubricate grease in your cv’s causes overheating and cracked the cage. The torn rubber boot can throw out all the grease from your side shaft. You are urged immediately to replace torn and worn rubber that going to keep your side shaft from rust and corrosion caused by water and you will drive your car many miles before your do any cv joint replacement. Check and inspect torn rubber boot and grease loss. Inspect and check for lubricated grease around the exterior side of cv boot. Check for a punctured and steel wire around your rubber boot or are torn. Check if your cv boot clamps are loose or broken. If your cv joint replacement are operating without any noises in turn or straight and lubricated grease is not dirty, dry, or mix with water you need to replace only your rubber boot. Do not keep driving your car with torn cv boot can results to your cv joint failure due to less of lubrication and corrosion. You can use suitable auto service and repair manual when attempting to make side shaft repair. If you do not have such a manual or luck the experience or the proper equipment to make such CV Joint replacement you should use the services of an automotive service centre or our free advice and information website when you subscribe and learn how you can do it your self. Fouzi’s Service centre has been servicing the city for 15 years. Contact us and save up to 20% on your co joint replacement , and free wheel alignment check at the value of R170. Find out more at Auto Repair Center Service Prices And Why You Need Auto Tune? I, Fouzi thank you for your visit and subscribe to Fouzis service centre. The part one of my Ebook ( How You Diagnose Your Car Problems To Save Money ) is Free for you to download subscribe now. If you need an automotive service repairs, any advice, quotations, prices, servicing your car contact me at fouzis service centre we offer the best service and prices in town for almost 15 years. Are you looking for the best price on cv joint and autoparts click here. Do You Want To Subscribe To My Free Information, Advice, News Letters And My Special Use The Form On Side Bar Click Here. The function of the CV Joint is to submit the power at a speed to the front wheels if the car is front wheel drive. Some rear wheel drives cars contain the side shaft at the rear axle. The CV can be at the front or at rear it is fitted to each ends of side shaft full with lubricant grease and cover rubber or CV boot. The function of the CV Joint allows a rotation side shaft to give power and speed, with less metal friction, that permit your car to drive smoothly with perfect engine performance. The perfect way to protect and extend the constant velocity joint life is to full up it with quality lubricated grease, clean and remove dirty grease. If you keep and driving your car with torn CV Boot and dirty grease can cause CV joint to wear and start making noise. Damage and wear of the outer CV joint you can feel it with high vibrations at when your car is on some speeds. The vibrations caused by wear CV is same if your car wheels not balanced. If you hear noises coming from your car suspension in turn left or right and same time even you driving straight the noises are from your CV’s joint. Due to less of lubricate grease in your CV joint causes overheating and cricked the CV cage. The torn CV Boot can throw out all the grease from your CV Joint. You are urged immediately to replace torn and worn CV Boot that going to keep your constant velocity joint from rust and corrosion caused by water and you will drive your car miles and miles before your do any CV Joint replacement. Torn CV Boot and grease loss. Inspect and check for grease around the exterior side of CV Boot. CV’S Joints clamp are loose or broken. If your CV’S Joint was operating without any noises in turn or straight and CV Joint grease does not appear dirty, dry, or mix with water you need to replace only your CV’S boot. If you keep and driving your car with worn CV boot can results to your CV joint failure due to less of lubrication and corrosion. You are urged to refer to a suitable Automotive Service And Repair Manual when attempting to make CV joint repair. If you do not have such a manual or luck the experience or the proper equipment to make such CV Joint replacement you should use the services of an automotive service centre. I, Fouzi thank you for your visit and subscribe to automotive service centre. The part one of my ebook ( How You Diagnose Your Car Problems To Save Money ) is Free for you to download subscribe now. If you need an automotive service repairs, any advice, quotations, prices, servicing your car and CV Joint replacement cost contact me at fouzis service centre we offer the best CV Joint replacement cost in town for almost 15 years. 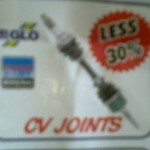 Get your 30% discount for your CV Joints replacement cost and free wheel alignment check. If you are looking for the best price on CV Joint replacement cost and your car autoparts click here. Fouzis Service Centre is member at Retail Motoring Industry Organisation (RMI) And Insurance Warranty Accredited. In House Financing Arrangement.